A great source for Jay's music in print or digital versions can be found in the so called Jazz Fake Books, available at Sher Music Co. Here below is a list of Jay's songs in the Real Books and Fake Books (generally written in C, Bb, and Eb). These books are also available at Amazon and through Faber Music in London for overseas customers. Here below we have listed some of Jay's music from his own collection of notations. They are all downloadable PDF documents. She Just Can't Make Up Her Mind Lyrics and brief sound bite available as well. Enjoy Jay Graydon performing the whole song together with David Foster and a huge Japanese orchestra in this video from the live gig. 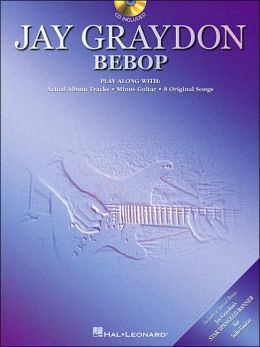 For the BEBOP album there is also a great play-along book with a CD available with the original recordings minus the guitar track, and all of the lead sheets for the 10 tunes on the album BEBOP. All written material, all images and photos in all sections of this website copyright © Jay Graydon/KEO 1996 - 2018. All rights reserved.